Would recommend this product. Very pretty!! Enrich your living area with this lively panoramic artwork. 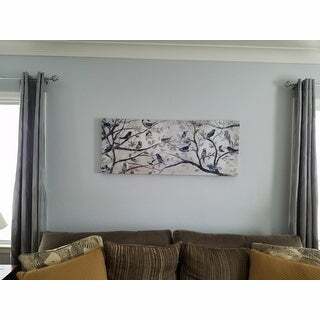 A gallery-wrapped design offers a professional-quality appearance, and a durable frame arrives ready for instant hanging. 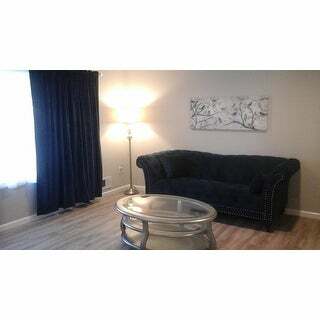 This picture matched perfectly with my living room, it looks exactly how I envisiond. Great quality! This is a nice print. Goes well with my living room colors but the size of the largest print which I purchased to hang over my sofa on the wall behind it is way too small. The pictures on the website are deceiving so make sure you measure your space before ordering. I am keeping the print and hanging wall sconces on each side to make up for the extra space on the wall. If this print were about 4 inches wider and 4 inshes longer it would have been worth the money. It is not worth the hassle of the return. This really is a beautiful print...purchased to go with a teal comforter also ordered on this site. I would highly recommend measuring out the size you intend on ordering, I did and ended up ordering the largest size available. It is long and narrow but fits perfectly above the bed. Many hues of blue and gray, truly easy to blend into our decor. Okay, this little 8 X 10 canvas just makes me smile. The birds are very lifelike, and the colors are mellow and pleasing. I put this in a guest bathroom that has an Asian tone; this canvas fits right in. I love this artwork! The colors are muted and will go with various schemes. If you like birds you will love this picture. It is very reminiscent of a group of sparrows or small birds gathering together and singing merrily. Guaranteed to lift your spirits. I am so glad I ordered the largest size 20 by 50. This picture is on a large wall above my tv in my den. A smaller size would not have worked there. I had originally ordered a smaller square picture which was beautiful but did not work well there. This one is perfect. It was also a real bargain as I used my rewards points to purchase it. I would highly recommend this artwork. beautiful! It looks great on the wall and the wrap is nice with the print on the side. Great colors, just as pictured. Unfortunately, it is too small for the wall I had anticipated for placement. I will be returning but plan to make a follow up purchase of a larger print. Good quality, nicely wrapped canvas. 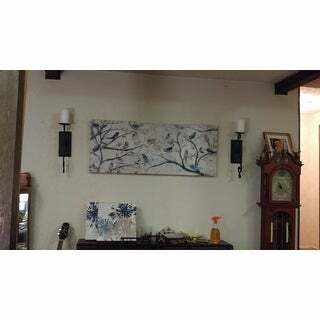 This piece is a canvas painting with grey and blue hues. It is a nice looking piece and will look good within the right setting. It looks pretty much like the illustration pictured. I purchased it to place it above our bed and am still undecided as to where I will eventually hang it. I am keeping it because I really like this piece, hence the main reason for my purchase. This would look great and expensive if framed. I will post pictures once I commit it to a space in my home. LOVE IT! Just as described. It has the effect of being hand painted, sufficient hanging brackets in two places for easier placement, and beautifully colored. 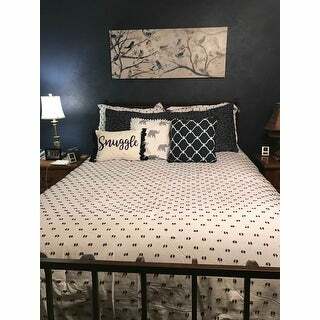 Perfect for newly re-decorated master bedroom-couldn’t be happier with purchase. I'm using the pic. 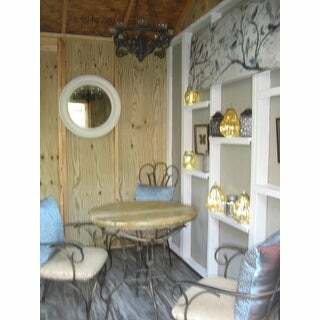 to Stage with... One of our properties has a mini shed and we are turning it into a transitional space... The shed is great for storage but many tenants use them for extra space/sq. 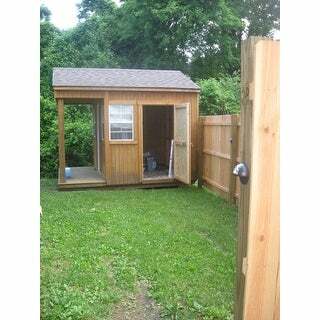 ft. for occasional dining, she shed/ man cave. outdoor kitchen,Etc.. I love the picture, but I think the quality could of been better for the price. 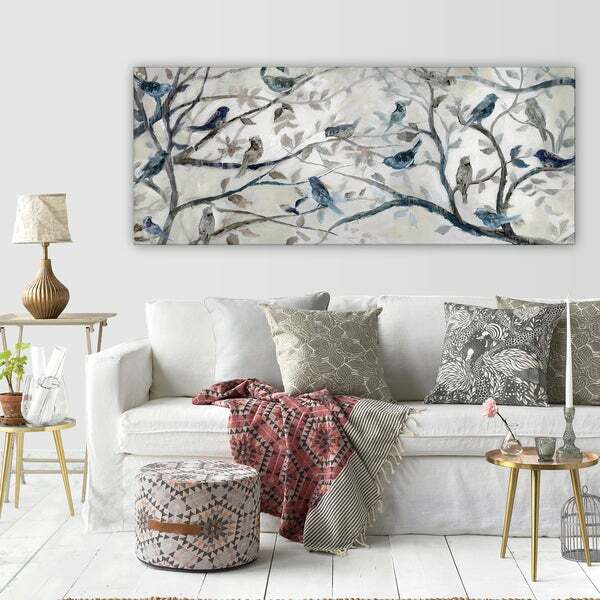 It’s a beautiful canvas of a flock of birds gathered on a blooming tree, the colors are what l thought they would be, very pleased, it could had even been a little bigger, but very pleased, thank you OverStock, hope this helps. Purchased for bedroom. Very calming print and colors. 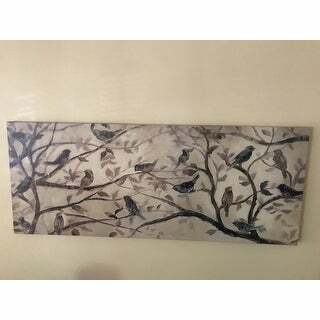 this canvas is indeed a nice one... my only complaint is that the vertical piece of wood in the middle of it was not connected on one side leaving the wood kinda just there not serving any purpose. even though I was able to hang it and am now enjoying the over all look. Love this canvas, ordered the 20 by 50 to put over couch. 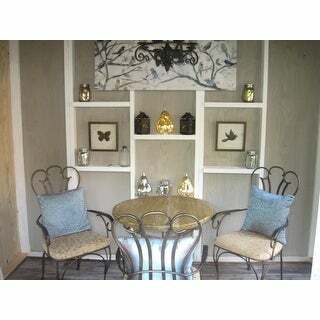 Its beautiful, the blues and greys match very well with our decor. It's a beautiful piece of art! I have a couple more pieces in my cart to purchase! Good quality for the price. "Are the colors silver and shades of grey and blue?" "Are the birds true blue or more teal or turquoise?" The birds are a true blue. I have this in my office at work and it hangs above my desk. I absolutely love this picture and get lots of compliments. "Are there a significant amount of browns in this picture ?? What color are the branches ?" My mother in law liked mine. So I ordered one for her. "What are the main colors in this piece?" This has a Silver background, blue background. "I'm confused as to the size options: under the options the sizes listed are 8 x 20; 12 x 30 & 20 x 50. However under the details & specs they are 18 x 27, 24 x 36 & 36 X 48. Which is correct?" The only sizes available are the ones listed in the options tab. We apologize for the confusion we might have caused.